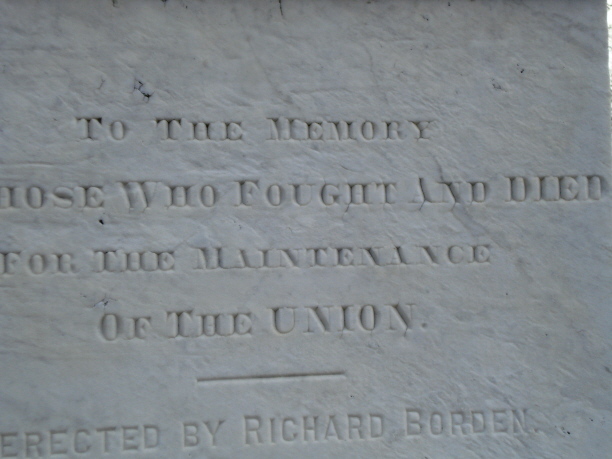 Col. Richard Borden’s monument and Civil War interments. One type of monument especially popular from the Civil War through 1900 is the white bronze or zinc monument. White bronze is a misnomer, for the monument is not made of bronze, but rather zinc or more rarely, iron. The final patina is whitish to pale blue to darker blue, and the great benefit of this type of monument is that the embossed metal panels and ornaments hold epitaphs and images in sharp relief for a very long time. They seem to take the weather, moss and lichen growth and acid rain exceptionally well. The only drawback is that attached elements, such as a top urn, can be easily snapped off, and seams, especially at the base, can separate. With the proper method of repair, however, this is not much of a problem, but trouble results when concrete is used as a filler. The zinc monument offers a good crisp image for monument rubbing using rice paper and soft heelball wax. 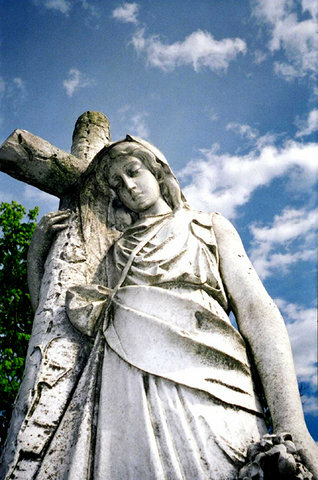 For more information on zinc monuments, visit these two links below. Oak Grove has many beautiful examples of this monument type. The first sight which captures the eye when passing under the great granite arch of Oak Grove is the obelisk given by Colonel Richard Borden in memory of fallen Union soldiers. Row upon row of simple white marble markers are reminders of the dark days of the Civil War and those who made the ultimate sacrifice in the line of duty. This is a peaceful place at sunset when shafts of golden light fall through the trees upon the pale stones.